Have a part to extrude hone in Orange CA? We can meet your exact specs, guaranteed. Sometimes called abrasive flow machining, extrude honing is an extremely useful process suitable for virtually any level of surface finishing or interior passage improvement. 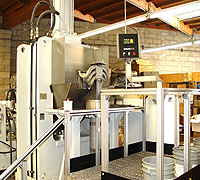 Extrude Hone AFM is here to help you with any part you need to extrude hone in Orange CA, whether it be a single automotive part in need of porting or an entire slew of EDM parts in need of recast removal. What metals can I extrude hone in Orange CA? The amount of time required to extrude hone in Orange CA really depends on the specs of your project and the cutting rate that you wish to achieve. But, we can definitely say that extrude honing is faster than finishing a piece by hand. It’s more affordable too. We have a huge stock of polymers and abrasive grits on hand so that prepping the media won’t add any delays to the process. For a quote on your project, please contact us online or call (562) 531-2976. Let us know a bit about your needs including what you want to extrude hone in Orange CA and we will give you a cost estimate and timeline to work with.